Yesterday Representative Andrew McDaniel (r) introduced a bill that would require every Missouri resident over the age of twenty-one to own a handgun. Details are now available. To amend chapters 41 and 135, RSMo, by adding thereto two new sections relating to the McDaniel Second Amendment Act. 41.1020. 1. This section shall be known and may be cited as the “McDaniel Second Amendment Act”. (2) “Resident”, a resident of this state who is twenty-one years of age or older and is not prohibited by law or court order from possessing a firearm. 3. Every resident of this state shall own at least one handgun. 4. Any resident twenty-one years of age or older who does not own a handgun on 10 August 28, 2019, shall have one year to purchase a handgun. Any resident who becomes twenty-one years of age after August 28, 2019, and does not own a handgun shall purchase a handgun no later than one year after becoming twenty-one years of age. 5. 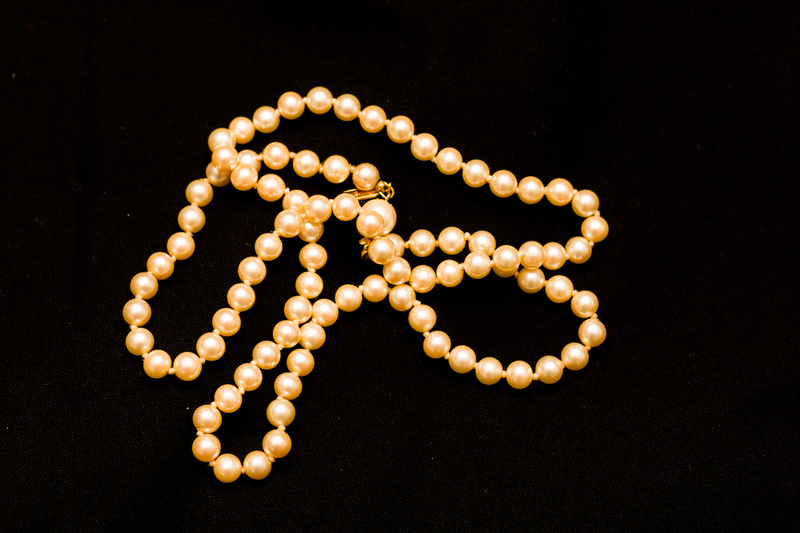 A resident may sell a handgun provided that the resident owns at least one handgun at all times. (2) “Taxpayer”, an individual subject to the state income tax under chapter 143. 2. For all tax years beginning on or after January 1, 2019, a taxpayer who did not own a handgun before he or she was required to own a handgun under section 41.1020 and who purchased a handgun in order to satisfy the requirements of section 41.1020 shall be allowed to claim a tax credit against such taxpayer’s income tax liability under chapter 143, excluding withholding tax imposed by sections 143.191 to 143.265, equal to seventy-five percent of the cost of the handgun purchased. 3. The total amount of tax credits authorized under this section shall not exceed one million dollars per tax year. Tax credits shall be issued on a first-come, first-served basis. 4. No tax credit claimed under this section shall be refundable. 5. The department of revenue may promulgate rules to implement the provisions of this section. Any rule or portion of a rule, as that term is defined in section 536.010, that is created under the authority delegated in this section shall become effective only if it complies with and is subject to all of the provisions of chapter 536 and, if applicable, section 536.028. This section and chapter 536 are nonseverable, and if any of the powers vested with the general assembly pursuant to chapter 536 to review, to delay the effective date, or to disapprove and annul a rule are subsequently held unconstitutional, then the grant of rulemaking authority and any rule proposed or adopted after August 28, 2019, shall be invalid and void. (3) This section shall terminate on September first of the calendar year immediately 30 following the calendar year in which the program authorized under this section is sunset. Uh, did the sponsor name the act after himself? Just asking. Well, maybe a miniature trebuchet with a wrist strap could work. You think? Do shares count? Just asking. I dunno, I think the share thing could still work. Can you still get a tax credit if you 3D print your own handgun? Just asking. That might make the tax credit go farther. The bill does include a sunset clause. Your right wingnut controlled General Assembly, always ready with the unintentional irony. If you’re sponsoring “symbolic” legislation like this she’s already winning. A missed opportunity to throw mom and apple pie into the mix. 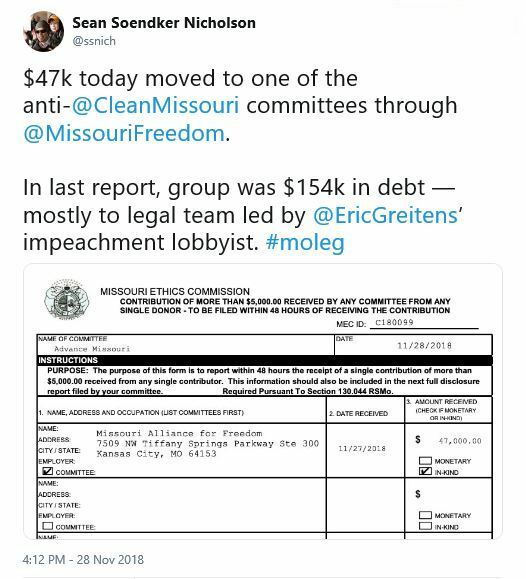 $47k today moved to one of the anti-@CleanMissouri committees through @MissouriFreedom. 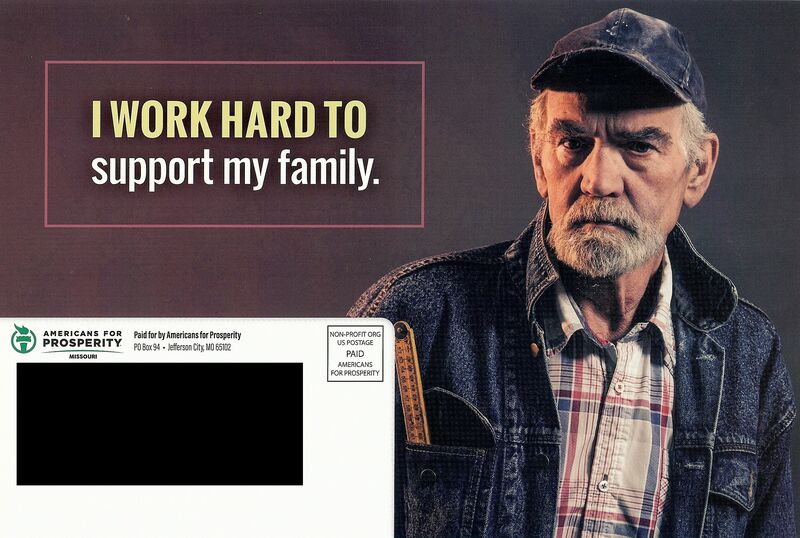 Right wingnut financed “astroturf” (fake grassroots) campaign mail – October 2018. 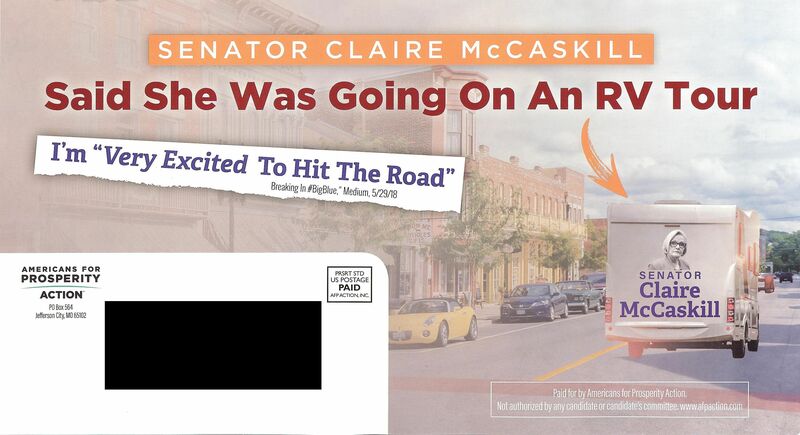 Wait, hasn’t Senator Claire McCaskill (D) traveled across the state holding over fifty open public town halls? What a great way to remind everyone of that fact. Josh Hawley (r) does have a flatbed truck. Donald Trump (r) and the republican controlled Congress gave a massive tax break to the top 1%, increasing the national debt by over a trillion dollars. They’ll be coming after Medicare and Social Security next. Hint: If you’re a billionaire you won’t ever need Medicare or Social Security. Raise your hand right now if you’re a billionaire. …Americans for Prosperity, the sprawling Koch political network, announced Monday the launch of a new super PAC arm as the organization gears up for the final stretch of the 2018 midterms. The super PAC, called “AFP Action,” will operate independently of the network’s preexisting 501(c)(4) nonprofit and with some key advantages. Per campaign finance laws, the new group will be able to spend unlimited sums on election activities while being subject to some loose disclosure requirements, The nonprofit arm, however, is subject to even looser disclosure requirements but must dedicate a portion of their spending to “social welfare” activities that cannot explicitly target elections. Anyone think the Koch brothers will ever hold open public town halls in Missouri? Nah, me neither. 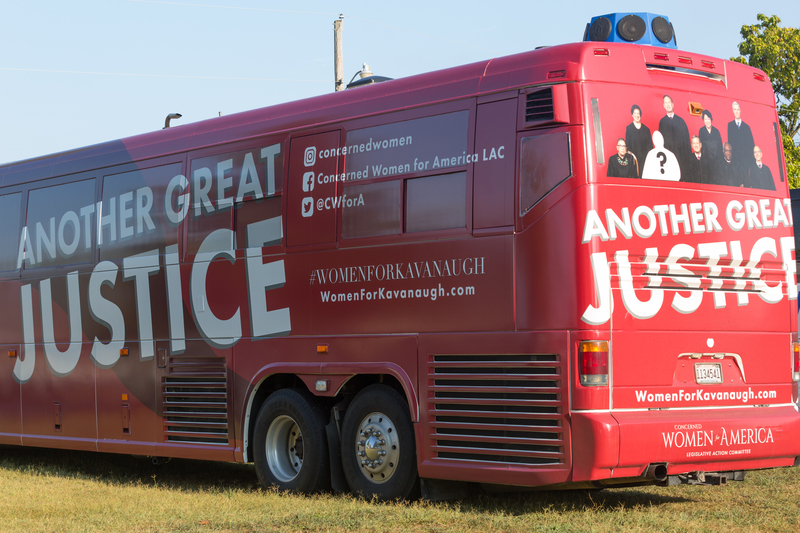 Campaign Finance: You were expecting nothing? There’s an election in November. They’ll have all the money they need. And more. The American Federation for Children is a 501(c)(4) organization that does lobbying and grassroots advocacy work in the states and Washington, D.C. We are affiliated with the American Federation for Children Action Fund, a political committee that supports and opposes state-level candidates for elected office. 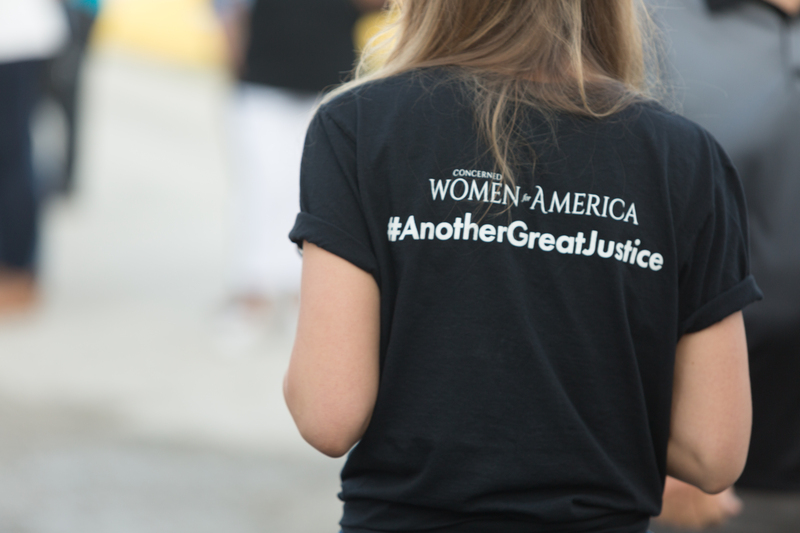 We work closely with our educational partner, the American Federation for Children Growth Fund, a 501(c)(3) organization, to promote the benefits of—and the need for—school choice, make parents aware of their options, mobilize grassroots supports and ensure private school choice laws work for students. The American Federation for Children works in states across America to advance our mission. Our headquarters are in Washington, D.C., with state-based staff located in regional offices around the country. Ah, they’re about defunding and dismantling public education. That’ll work so well in rural Missouri. In the same way right wingnuts blocking Medicaid expansion helped rural access to health care and rural hospitals prosper. Oh, wait. U.S. Term Limits (USTL), based out of Washington, D.C., advocates for term limits at all levels of government. In 2016, USTL launched the Term Limits Convention, a new project to enact a constitutional amendment for congressional term limits. Under this approach, state legislators can enact term limits for the Congress in Washington and no member of Congress can stop them. And that way only lobbyists and special interests, not elected legislators, will hold any legislative institutional memory. Why, that takes us down the road towards kakistocracy and kleptocracy. They consider that a feature, not a bug. 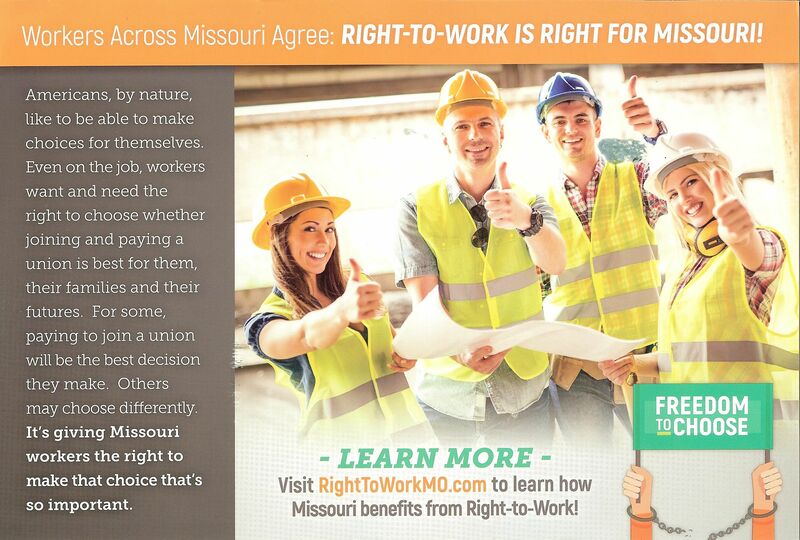 That is the message in the anti-union Proposition A “right to get paid less” campaign mail strategy of Americans for Prosperity – Missouri. 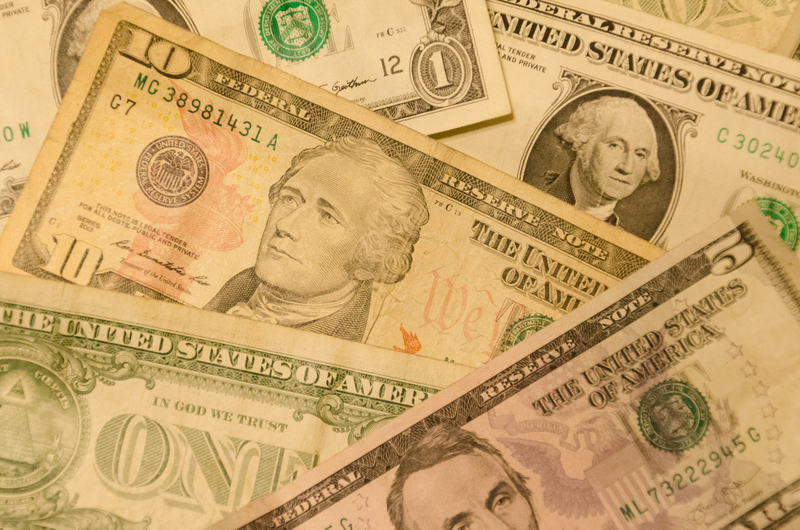 Proposition A would allow workers who don’t want to pay Union dues for the Union representation in their work place to accrue the benefit of that Union representation without paying their fair share for it. Chains? Really? What genius thought of that? Uh, pro-choice, eh? 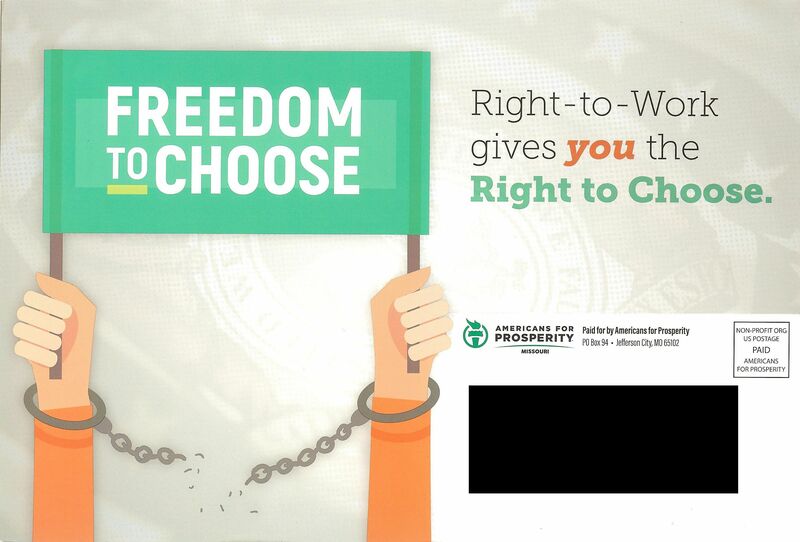 “Freedom to choose” – they can’t believe we’re all that stupid. Well, yes, they can. Note the state seal (in the gray background) – “United We…Divided We Fall”. That’s a rationale for collective bargaining. 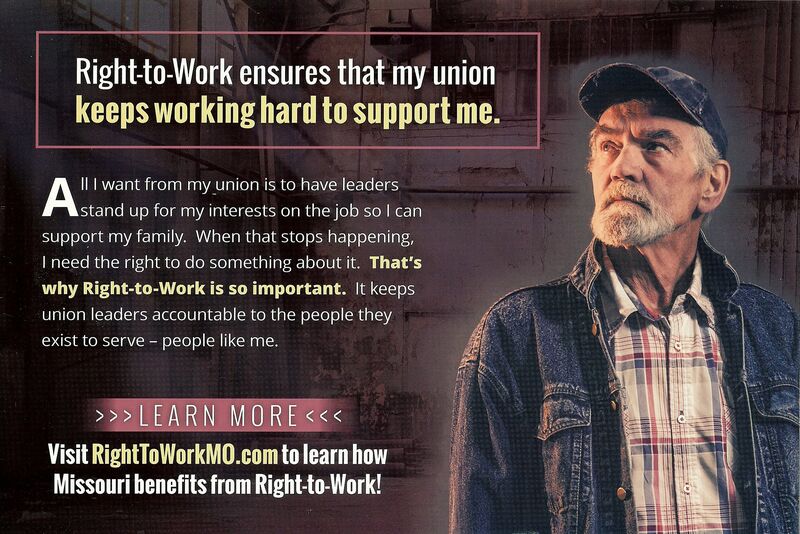 “Right to work” gives some people the right to sponge off of the resources and hard work of their co-workers. The diversity in the photo is just knocking the message out of the park. Not. As if this about workers? This is about right wingnut corporatists who don’t want anyone to pay workers meaningful living wages. Period. Vote “No” on the anti-Union Proposition A in the August 7th primary. 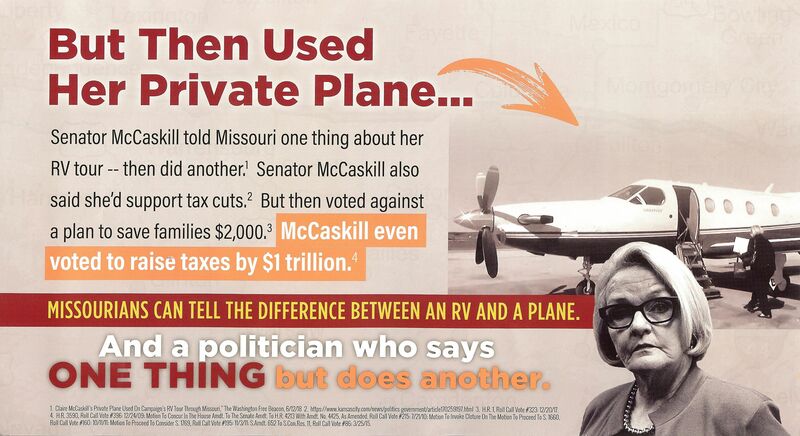 That appears to be the message in the Proposition A campaign mail strategery of Americans for Prosperity – Missouri. Is that model wearing one of those stone washed jackets? Just wondering. Uh, Unions have regular elections for their leadership. That’s how union members keep their Union leaders “accountable”. How do workers keep their corporate “leaders” accountable? That’s easy. With Union representation.